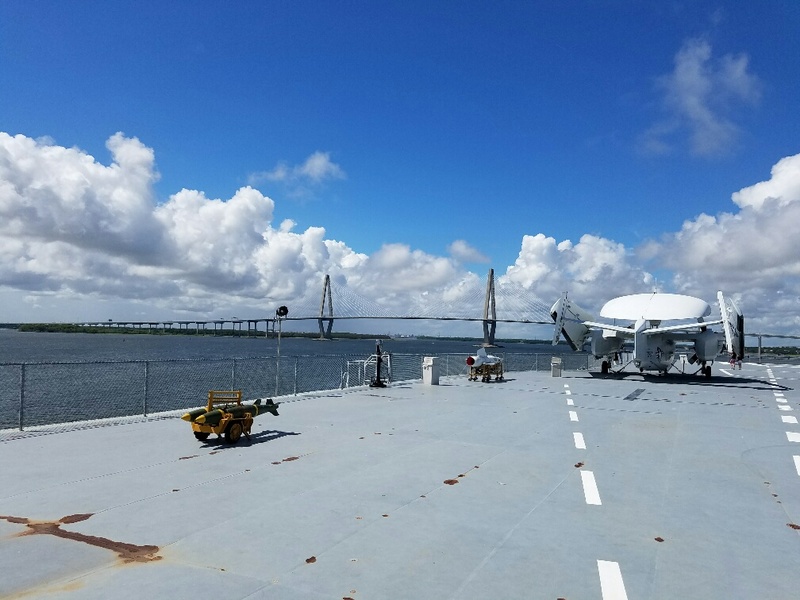 Charleston – Patriot’s Point – Live MoHo! There are so many interesting things to do in Charleston that we weren’t sure where to start. 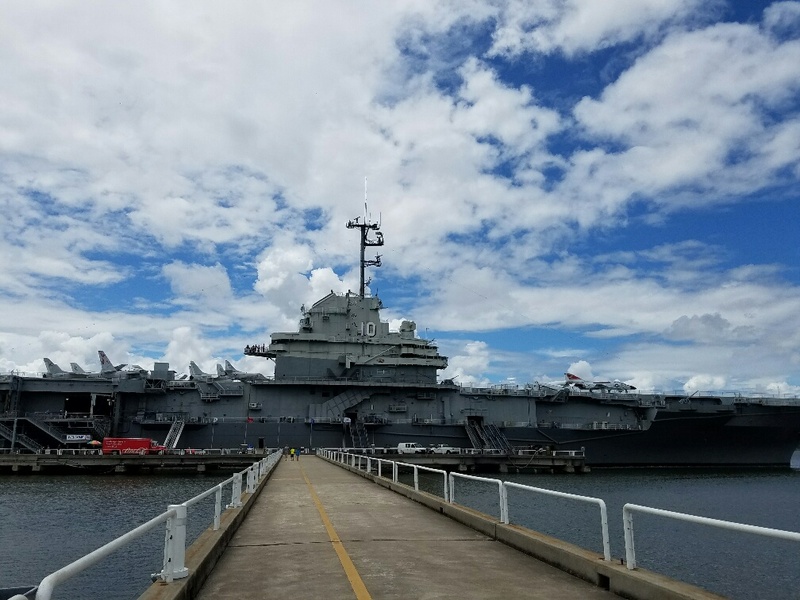 We settled on a visit to Patriot’s Point where the USS Yorktown aircraft carrier, the USS Clamagore submarine, and the USS Laffey destroyer are on display. 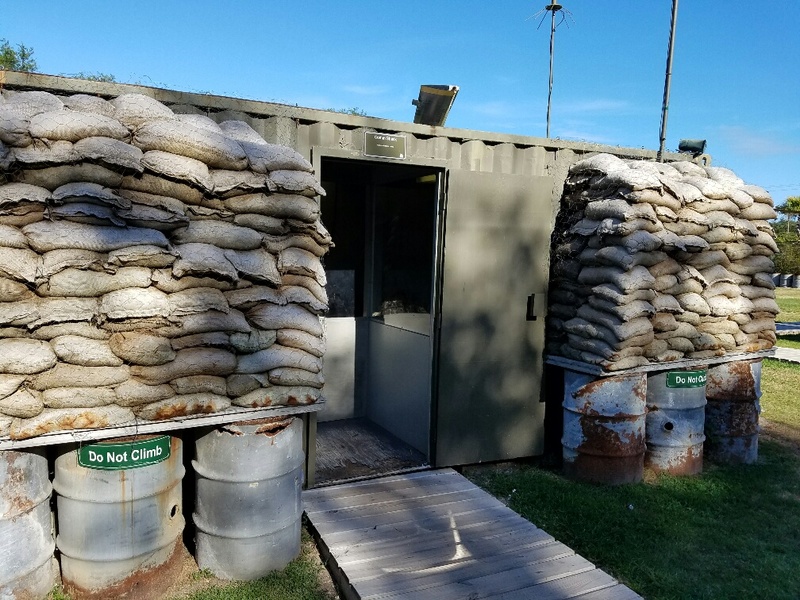 A Vietnam war section has also been setup at Patriot’s Point. 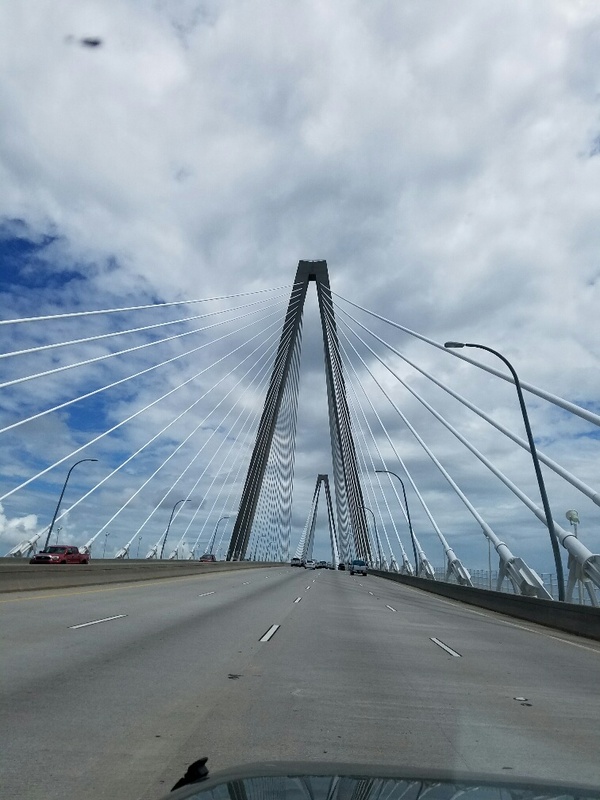 Our drive took us over the Aurthur Ravenel Jr. bridge. The bridge is a feat of design, and is the 3rd largest cable-stayed bridge in the Western Hemisphere. The total length is 2.3 miles, with the main span being over 1500 feet in length. The bridge offers over 180′ of clearance above the channel below. The signature diamond-shaped towers soar 575′ into the sky! One we arrived at Patriot’s Point, we saw the mighty USS Yorktown moored at the pier. The Yorky is a distinguished veteran of WWII (where she earned 11 battle stars and a Presidential Unit Citation) , Korea, Vietnam (5 battle stars), and was the recovery ship for the Apollo 8 lunar mission. In 1975, she became a museum ship and took up her current post at Patriot’s Point. Crowds were light as we boarded this impressive carrier. 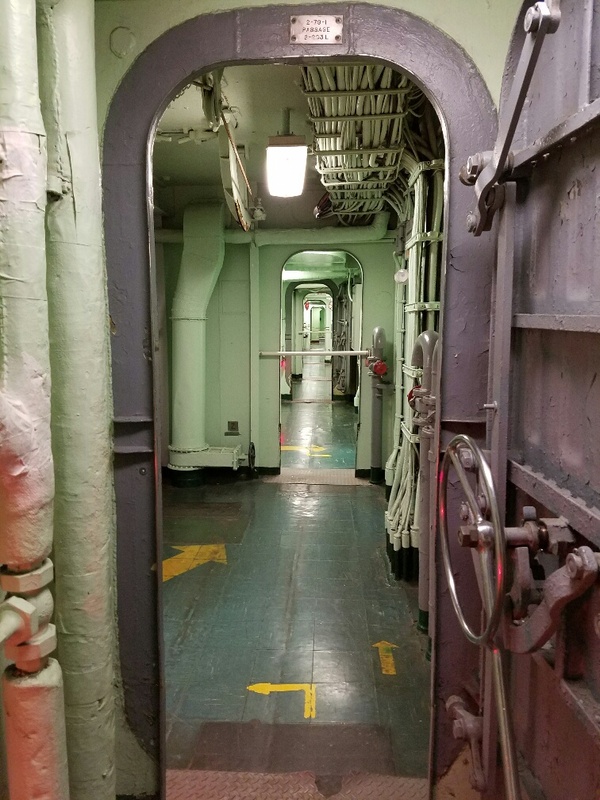 Most of the tours are self-guided and we were impressed to see that quite a bit of the ship is open for viewing! Most of the time we were alone as we explored below decks. The only guides being yellow painted arrows on the floor to show us the recommended path. Most areas of the ship have been restored or if not restored, at least cleaned up. 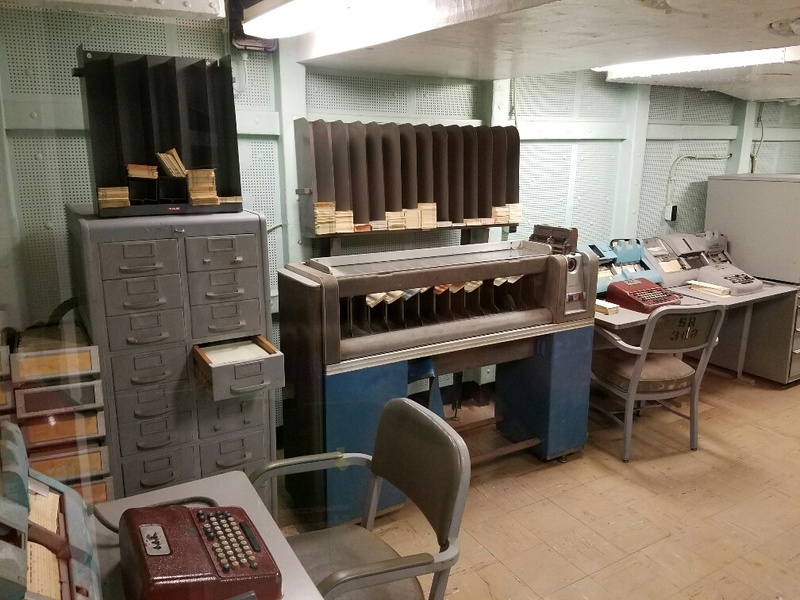 Various periods in time have been showcased, like this operations room that has punch-card computers on display. I never used a punch-card computer, but I knew plenty of people who did. They said the worst think you could do was to drop the box of punch cards and get them all out of order! I don’t know if we have a modern equivalent? 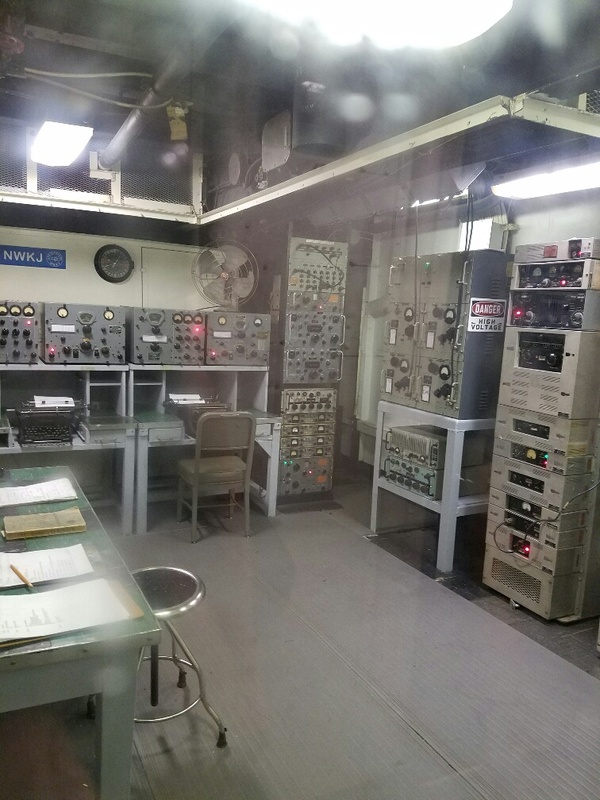 The radio room was in amazing condition, with much of the equipment appearing to still be functional. 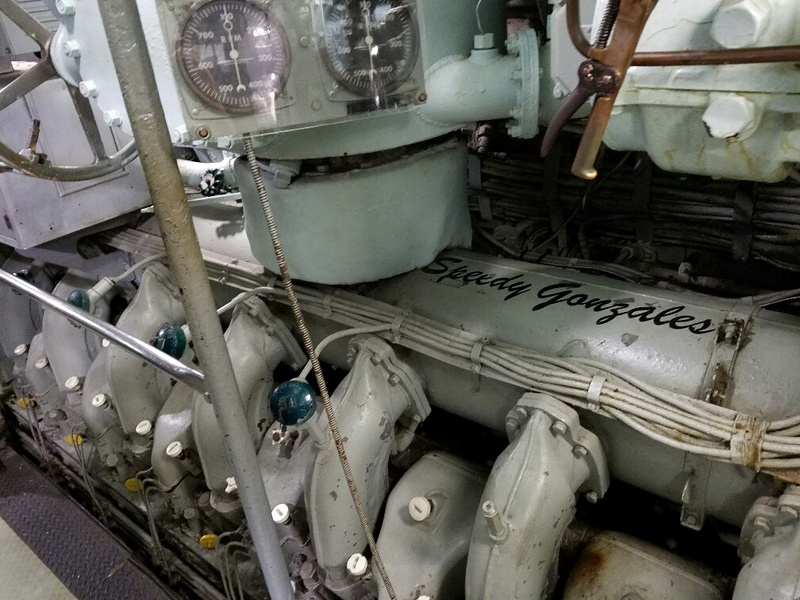 While many parts of the ship have been meticulously setup, some parts remain either off limits or in less-than-pristine condition. The engine room is one of those areas. 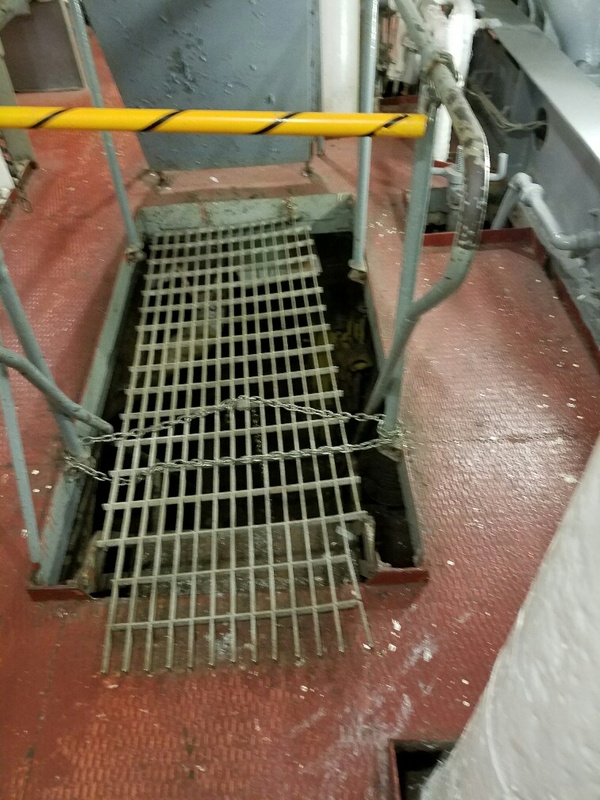 After seeing the warning signs about the steep ladders and tight quarters, we descended 5 decks to the engine room. The massive boilers were on display along with the turbines connected directly to the 4 propeller shafts. It was miserably hot down there and I can only imagine what it was like when the boilers were lit! Ladders down to the lowest levels were blocked, somewhat crudely in comparison to upper levels of the ship. Still, I don’t think anyone would fall down that hatch. We climbed up the 8 flights from the lower boiler room to the flight control center in the control tower. 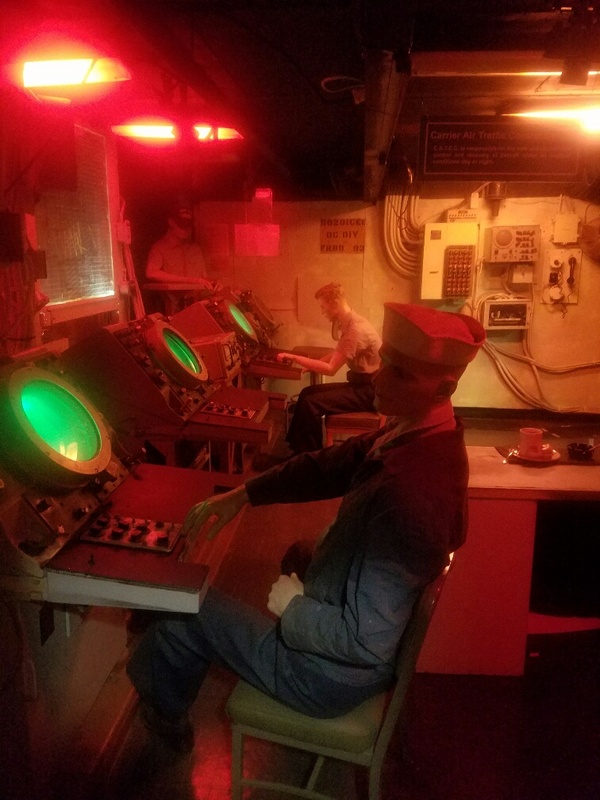 The combat information center was setup to show what it was like when the carrier was at sea! 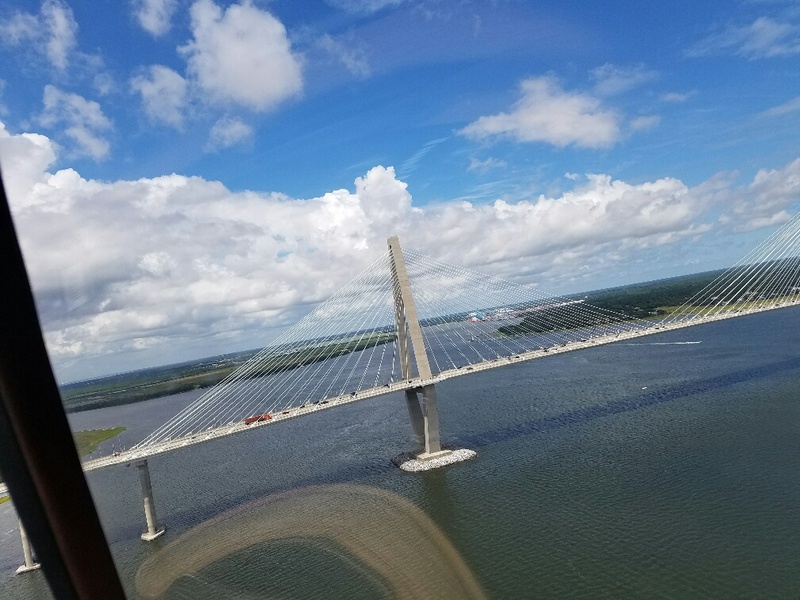 Views from the flight deck are spectacular, particularly of downtown Charleston and the Ravenel bridge! From the Yorktown, we went over to the USS Clamagore submarine. It is actually in fairly poor shape. 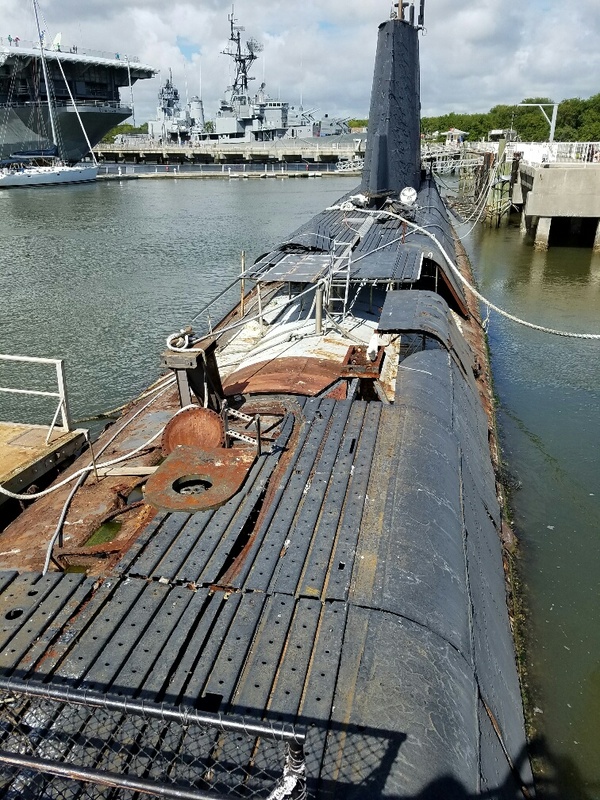 Huge pieces of the superstructure have been removed and the pressure hull is exposed. There is a lot of rust all over the exterior. I felt like I needed a tetanus shot just after taking this picture. That’s gonna take more than just a little Krylon to fix. 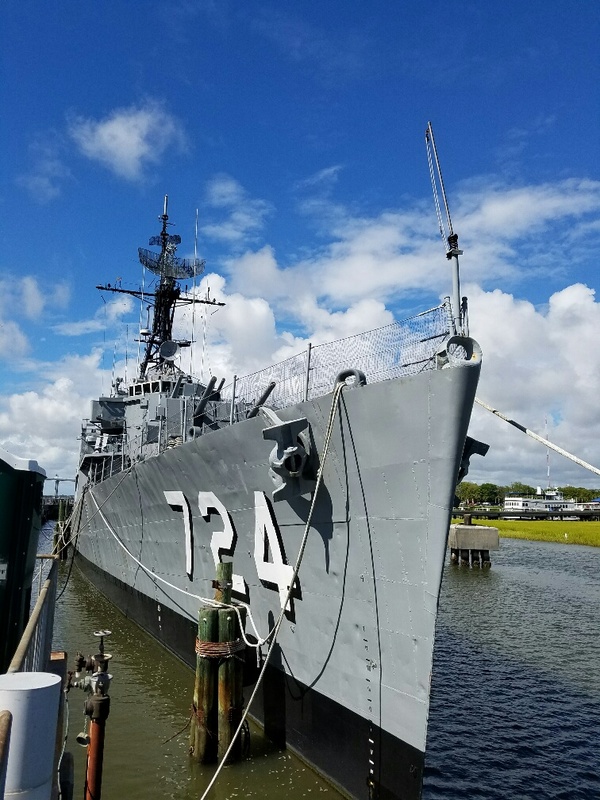 Last ship on the tour is the USS Laffey, known as the “ship that would not die.” In WWII the Laffey was hit by the biggest kamikaze attack of any ship in WWII. She suffered 6 kamikaze hits, 4 bomb hits, and untold rounds from strafing machine gun fire. Tough little ship and tough crew! 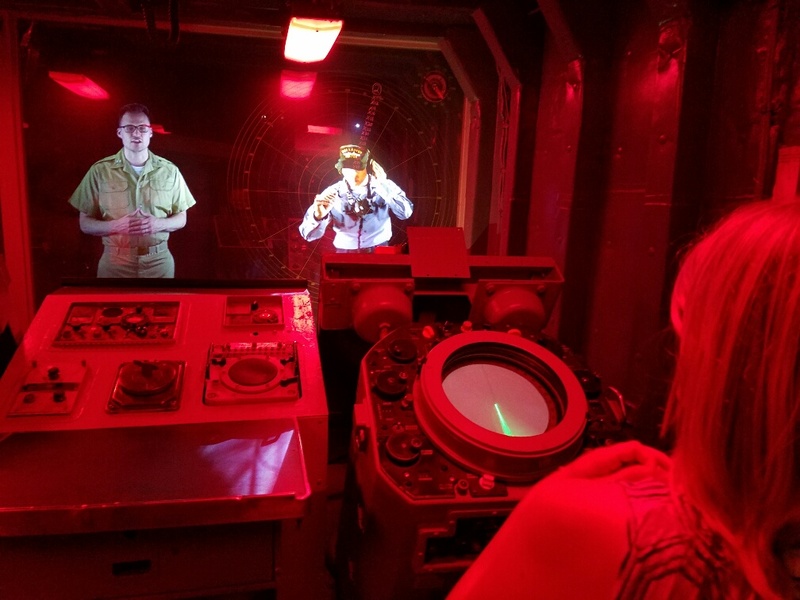 The Laffey control room has been upgraded to a multimedia experience simulating an encounter with a Russian submarine in the Mediterranean sea. It is well done considering the limitations of working in the CIC. We left the ships and walked back to the shore where the Vietnam war area is setup. They have bunkers, hooches, PX, and other displays. The area is very well done. 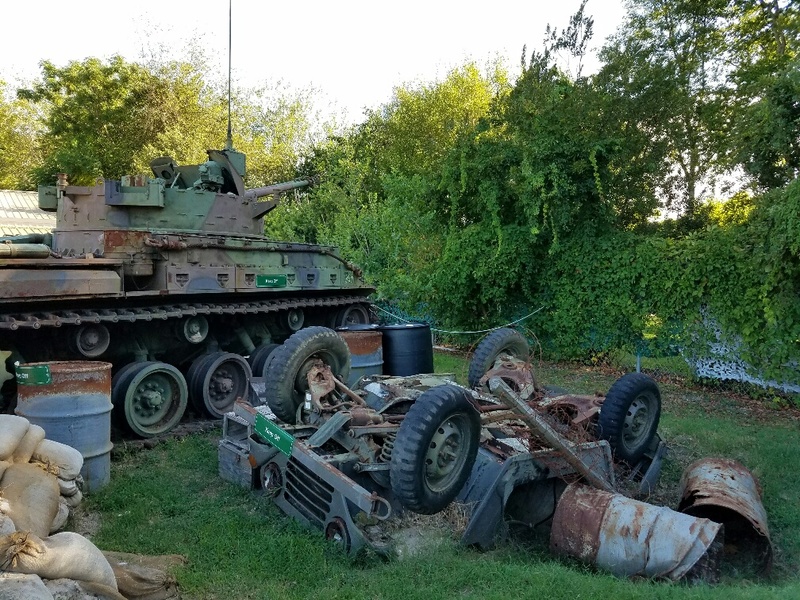 At one spot an anti-aircraft “tank” was setup for patrol duty next to an overturned Jeep. 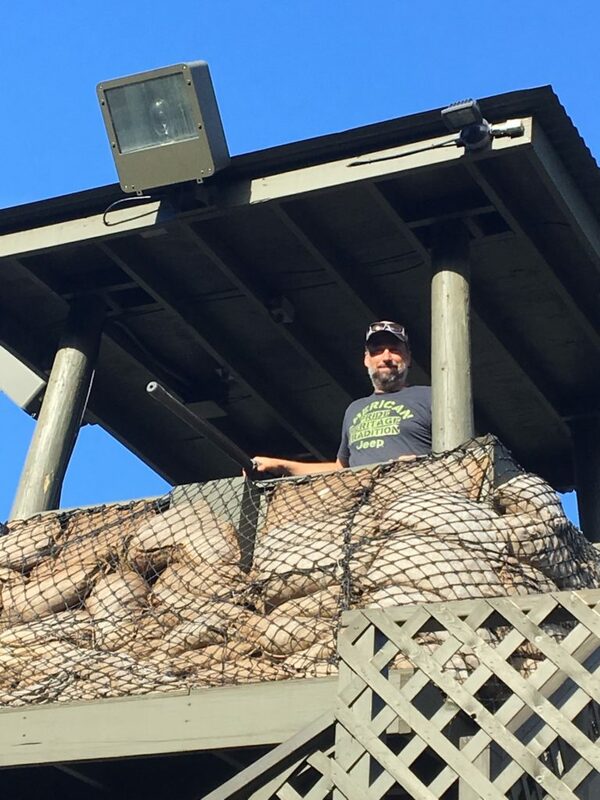 Guard towers look over the area, complete with Vietnam-era equipment and machine gun. 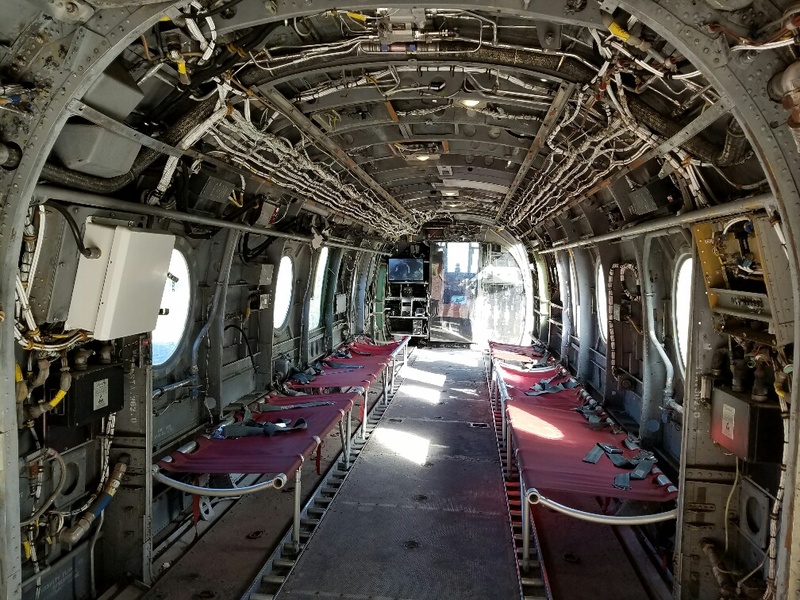 Several helicopters were on display including this troop transport helicopter. 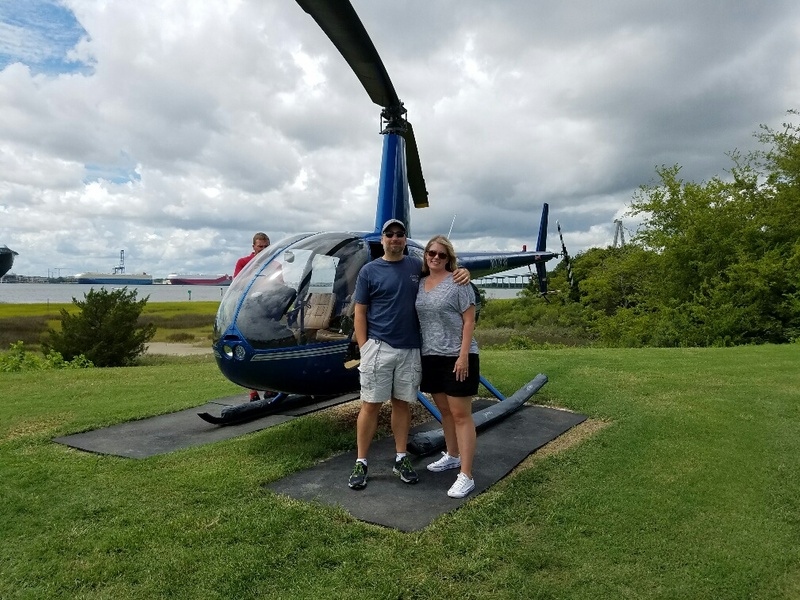 The highlight of the visit was the helicopter tour we took of the Bay. 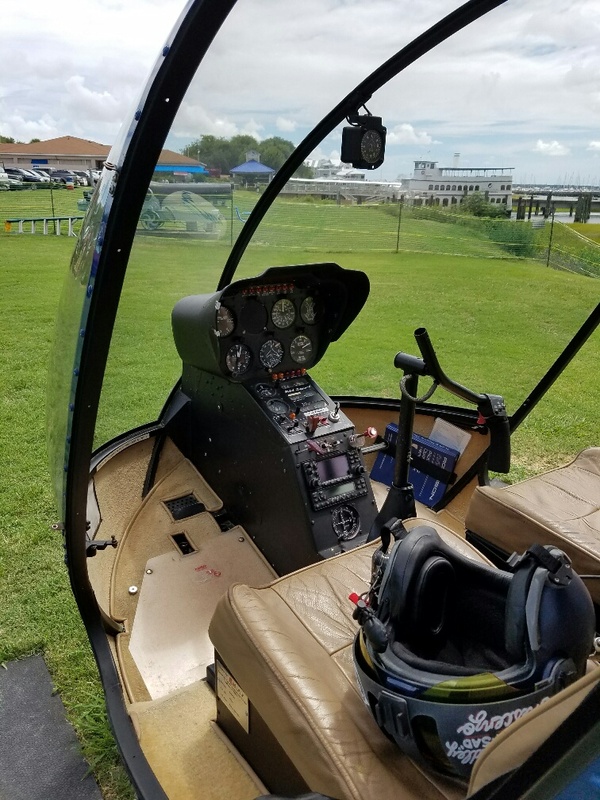 The chopper had a huge plastic bubble cockpit and the doors had been removed. That made the ride thrilling, especially when the pilot banked hard in the turns! Patriot’s Point is a must do for any military buffs visiting the Charleston area!